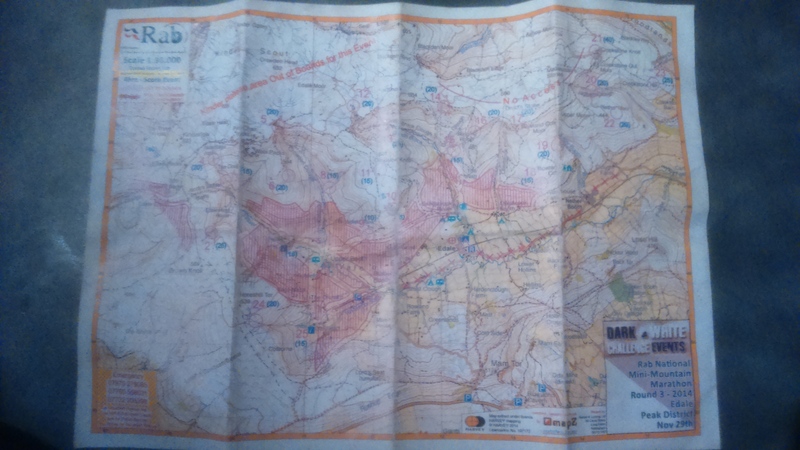 If like me, you’re not familiar with the format of mini mountain marathons, on arrival entrants are given a map and have 4 hours to navigate to up to 25 checkpoints. Each one is worth a number of points that varies depending on the distance and degree of difficulty finding it. If you are back late, you lose those points. The checkpoints are tiny boxes deposited on crags, in gullys, and behind crumbling dry stone walls and are distributed in an area around 25 square kilometers. 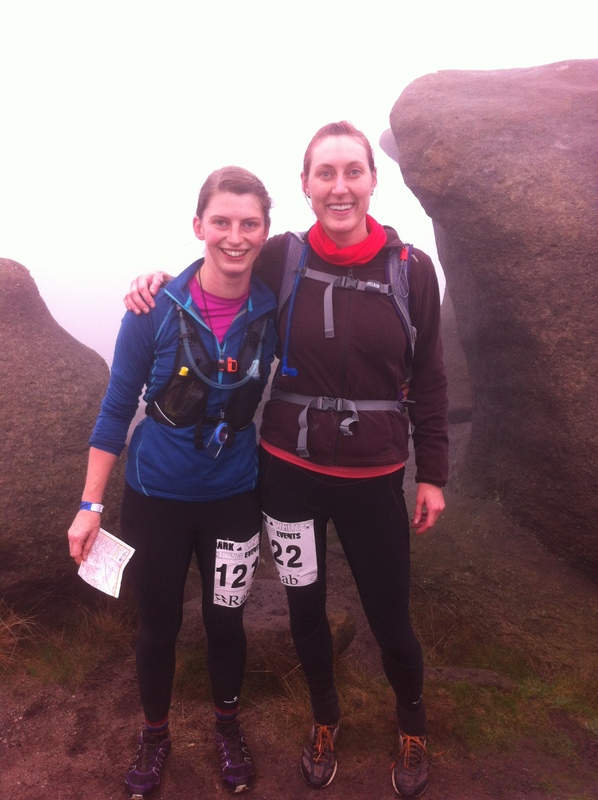 I have entered as a team of two with Bodil – we are regular trail runners and have high hopes of speedily picking up a respectable number of points. As entrants can choose what time to set off between 8.15am and 10am there is no rush of start line adrenaline, and no other runners to lead the way. Bo and I have a quick scan of the map, loosely agree a route and set off running. In no time we arrive at the point where the little circle on the map indicates that the checkpoint should be. Locating it is not as easy as expected – we are in the right place but we just can’t see it, and suddenly the little circle feels a lot bigger. Three steep gullies join here and it’s somewhere in one of them, so we split up and search until we finally locate the checkpoint. It has taken half an hour, but we have 15 points! We decide to take the direct line to the next checkpoint and enthusiastically thrash our way up one of the gullies through running water, boggy black peat, and springily resistant heather. There is no trail, not even a sheep track, we are forging our own way and I realise that this is not going to be normal running or racing. At the top of the gully we join a path as expected, and feel pretty sure we know where we are. According to the map there is another checkpoint relatively close by, I can see a trail and I just want to run down it so I urge Bo to follow me. However, after about a kilometer of enjoyable but fruitless running, we are forced to admit we are not where we thought we were and there is no checkpoint here. We give up and retrace our steps, uphill. Our next checkpoint is at Ringing Rodger and the clue says simply ‘top of rocky outcrop’. I know that this is a familiar landmark and on any other day would be easy to spot, but we can’t see any rocks at all, and definitely not an outcrop. Feeling slightly guilty about leading us astray down the previous trail, I decide it might be better to let Bo navigate, she has the compass and seems more confident about where we are and where we’re going. Following another well-defined trail, we sense we are close as figures begin to appear and disappear in the mist. The scene feels a little surreal as we press on until suddenly there is a steep drop to our left, and a checkpoint nestled in the rocks right in front of us. Another hour has gone by, but at last we have 20 more points. We quickly eat fruit bars to keep our energy up, and now that we have located ourselves we are on a roll. On the edge of the Kinder Plateau Bo leads us to the next three checkpoints and we earn 65 points with relatively little trouble. 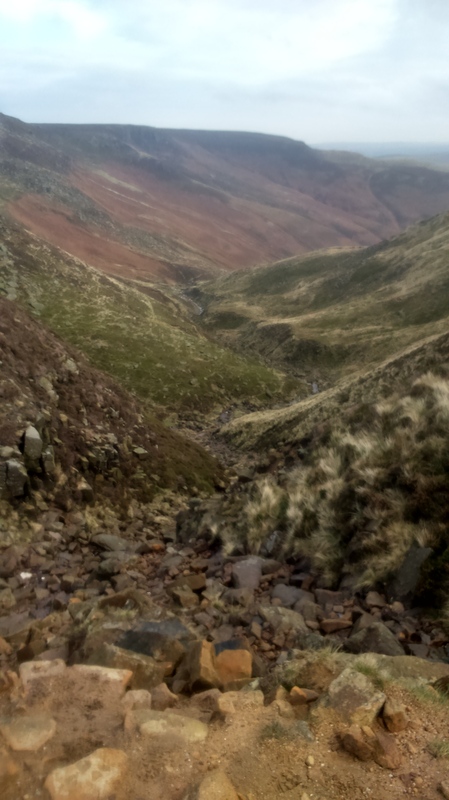 The third is located at the bottom of Grindsbrook, one of my favourite hikes in the Peak District – to make it more interesting we follow the river itself rather than taking the less direct but easier footpath. I feel at home again, scrambling on rock in a small gorge, wintery water gushing past us as we descend maybe 125m back down the valley. From this point we decide to leave the comfort of the path and strike out south, to a checkpoint that I don’t realise is on the other side of the highest point around. Having just descended, we power up a steep hill, the top of which reveals another steeper hill. We climb rapidly and then then speedily descend, but in all of the striding up the hill and the wiggling down it, we have lost our bearings and find ourselves somewhere south… or possibly west… of Grindslow Knoll. After trotting around the tussocky field for a while, the fence/wall junction checkpoint is suddenly visible just ahead of us and we have 15 more points. Now with about 25 minutes to go, we are almost back to Edale. It’s too soon to go home, but to attempt the next checkpoint is risky. We know that it is doable though it will be tight and it takes us just seconds to commit to it, knowing that it is uphill all the way there but downhill on the way back. At this stage, what would normally have been an easy run feels like crazily hard work. A stream of people finishing their race stroll happily past us in the opposite direction as we plough our way upwards through a series of exceptionally muddy fields of sheep poo. We finally see the checkpoint… at the top of a steep embankment. My legs are burning, my heart is pounding… but it is within my grasp and I am so determined to reach the top and those 10 points. Bo must feel the same as she seems to leap up the hill and is at the checkpoint well ahead of me. We shout to each other as she dashes back down, “Come On!! !” As I catch her up we have 8 minutes remaining… and I know we can make the final kilometer. This feels like my kind of racing again and although the road through Edale has never felt so long I am full of joy as we muster up a sprint finish after four hours and make it home with three minutes to spare! 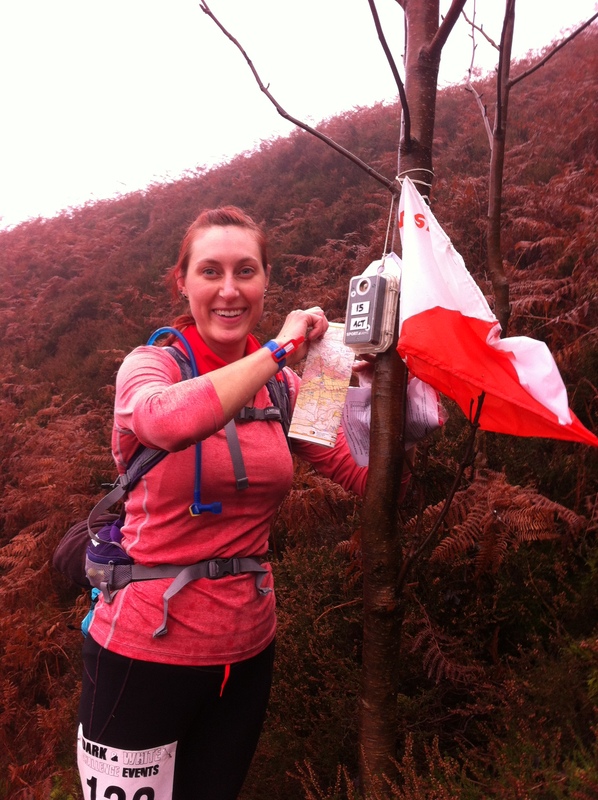 This entry was posted in Race reports, Trail running and tagged Hiking, mountain marathon, navigation, outdoors, peak district, running, scrambling, trail race, Trail running on December 4, 2014 by Anna Paxton. Climbing has taken up the majority of my time and energy for the past couple of years, so I haven’t entered a 10k race for a long time. When an injured friend offered me his entry into the Sheffield Tententen, which starts five minutes from my front door, I grabbed the opportunity to get back into running. I don’t find it easy to just potter round, when I run I want to run the fastest and hardest that I can, and since I hadn’t really been training I wasn’t sure how I’d perform. The Endcliffe Park 10k is not a race to aim for a PB, it involves two 5k loops with a short road section, a short but very steep (and muddy!) hill, and some fairly narrow undulating trails through the woods. I usually prefer to run on my own, so I was concerned about feeling crowded in the race. It really wasn’t a problem, I should have worried more about my lack of fitness on the hills, they were short but sharp and I really felt it! Ideally, I wanted to finish in under 50 minutes, my final time was 50:06. I knew it was close, but I’m happy that I ran as hard as I could and just couldn’t have squeezed the extra 6 seconds from anywhere. It’s a great benchmark time for my first 10k in two years, and I’ll be aiming to bring that right down in 2015. I have run this race in previous years, and it’s one of the best 10ks that I’ve entered. Endcliffe Park is ideal for friends and family to watch so there’s a great atmosphere, it’s really well organised by runners for runners… and the T shirts are the best designed with this year’s orange my favourite so far! If you want to enter next year, or would like more information about the event, this is the website http://www.sheffield10k.com. 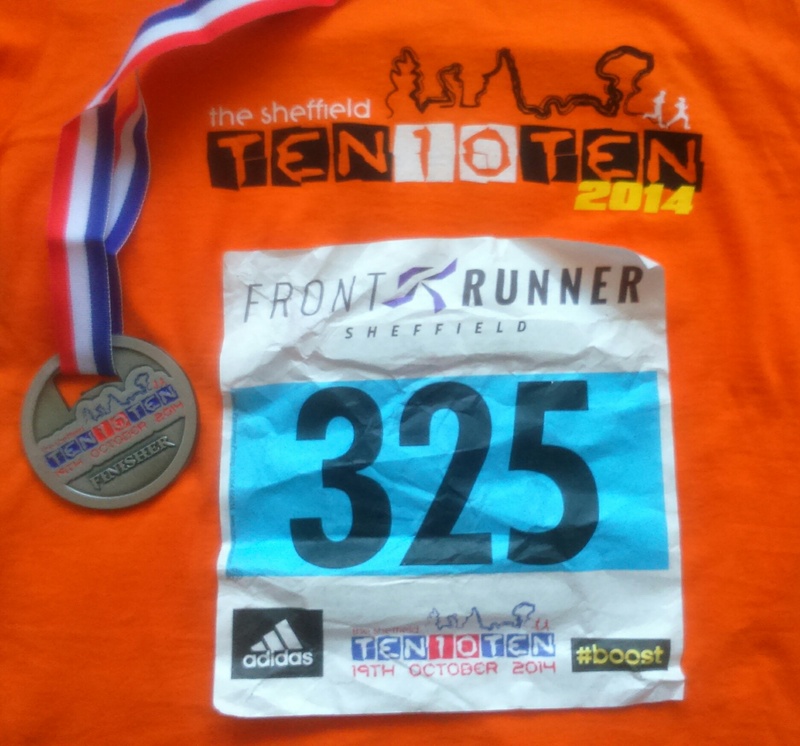 This entry was posted in Race reports, Trail running and tagged 10k, endcliffe park, running, sheffield, tententen, trail race, Trail running on October 25, 2014 by Anna Paxton.